Interview with the author of, Don’t Worry! 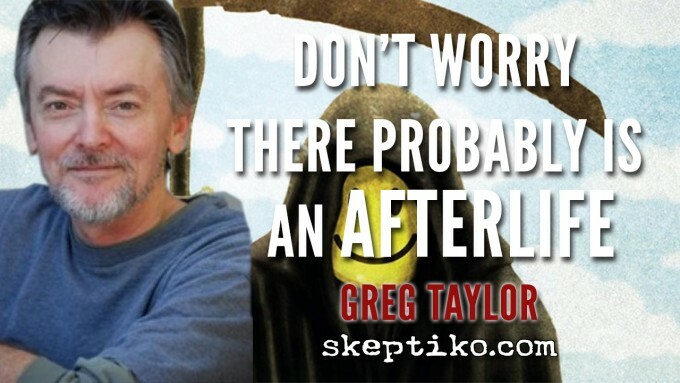 There Probably is an Afterlife looks at deathbed visions, near-death experiences and other scientific evidence suggesting survival of consciousness. A pleasant interview, Greg seemed calm, reasonable and grounded in reality. Additionally, some interesting statistics to uncover about death-bed visions and how often the carers of the dying are aware of them happening. And I agree about your theories about why death-bed visions get a lot more ignored than NDEs. The only thing in the interview that felt a little "uhh.. okay?" was when he mentioned how the data which falsified the supposed study that is used to refute free will gets completely ignored, but at the same time said that people jump on everything Rupert Sheldrake says. Well, those are essentially the exact same things. The only difference, I suppose, is that when they attack Sheldrake (and those like him), they are not attacking his science and his arguments, but his character and conclusions. When other scientists get the same results, I guess ignorance simply works best. With that said, I haven't investigated anything about these particular experiments. Enjoyed the interview very much. I'll check out the book, I am planning to get the Kindle version and go through it during the xmas vacation. Minor correction - about halfway down the page, Janice Miner Holden is spelled "Genis Minor" Holden. Fenwick's 2008 book The Art of Dying: A Journey to Elsewhere (maybe because of its title, which doesn't give away too much) I feel hasn't received the attention it warrants. It fleshes out the study Greg Taylor mentions and you get a lot of rich accounts, as well as after-death communications (including shared ADCs) and shared NDE experiences (the lines get blurry between these categories). Other titles include Parting Visions (Melvin Morse, 1994), Elizabeth Kübler-Ross co-author David Kessler's Visions, Trips and Crowded Rooms: Who and What You See Before You Die (2010), the classic At the Hour of Death (Osis & Haraldsson, 1977), the even older classic Deathbed Visions by William Barrett (1926). Another interesting category in the "dying" (can we stop using this word?! ) process is "NDA": "Near Death Awareness": people who "know" and give indication as to when they'll "die" (sometimes related to receiving a vision). This gets covered in the book Final Gifts (1992) by the hospice workers Maggie Callanan and Patricia Kelley. p.s. I don't know how to answer Alex's question. To me, it's a no-brainer. It's consistent! Spirits depart, move on, change dimensions. There was an interesting thread on the old forum that linked to another forum that was populated by nurses who worked in long term care. They maintain a thread there where they add stories of shared death experiences, which they see on a regular basis. There are thousands of anecdotes on that thread that relate evidence for survival. I'm way too lazy to look it up. But it is out there for those who require more evidence. What struck me, was the matter of fact way these are reported - I mean the nurses seemed to be simply describing a fairly normal part of their work. Funny how the skeptics are so cliché, there's no way to escape the usual litany about "extraordinary evidence..." and the "spaghetti monster"... gee I thought critical thinking was something more than parrotting slogans. "I also had creepy experiences that I cannot forget.But I don't want to scare anyone so i'll just keep it to myself." We wonder what these are. Like the Balfour story? But the editors have to tack on the headline -"The Brain: The Power of Hope"
My husband died at home. I was his end of life caregiver (he had brain metastases and cancer elsewhere in his body). A few days before he left, he woke up in the AM and asked me where he was and who were "those people over there". I told him his body was dying and those people were probably there to help him. He died a few days later.....but refused to go until I left him alone. The hospice nurse told me about one patient who was talking to her mother on the ceiling and explaining that she couldn't leave quite yet because her family (who was gathered around her) still needed her. Fenwick's 2008 book The Art of Dying: A Journey to Elsewhere (maybe because of its title, which doesn't give away too much) I feel hasn't received the attention it warrants. It fleshes out the study Greg Taylor mentions and you get a lot of rich accounts, as well as after-death communications (including shared ADCs) and shared NDE experiences (the lines get blurry between these categories). Other titles include Parting Visions (Melvin Morse, 1994), Elizabeth Kübler-Ross co-author David Kessler's Visions, Trips and Crowded Rooms: Who and What You See Before You Die (2010), the classic At the Hour of Death (Osis & Haraldsson, 1977), the even older classic Deathbed Visions by William Barrett (1926). A book along the lines of 'Don't Worry ...' but twice as long is David Fontana's Is There An Afterlife? : A Comprehensive Overview of the Evidence. Another book on shared death experiences I thought was well done is Glimpses of Eternity by Raymond Moody with Paul Perry. My husband died at home. I was his end of life caregiver (he had brain metastases and cancer elsewhere in his body). A few days before he left, he woke up in the AM and asked me where he was and who were "those people over there". I told him his body was dying and those people were probably there to help him. He died a few days later.....but refused to go until I left him alone. I could have sworn I read this account before but a quick Google brought forward nothing. Maybe it was in Moody's book, I dunno, but it appears that you have a deeper understanding of where he is now. Not saying that means that you are not bereaved or upset or even angry but perhaps less so than others. The hospice nurse told me about one patient who was talking to her mother on the ceiling and explaining that she couldn't leave quite yet because her family (who was gathered around her) still needed her. Another interesting category in the "dying" (can we stop using this word?! I used to be adverse to the word and tried to dance around it with "passing" or " transitioned" or whatever and got tired of it all. Dead is dead. Physical things die. Die, die, die. Dead, deader than a doornail, dead. Nope. These are my own experiences and I've only related them to a few friends and family members (except here).